The radish belongs to the mustard, or Brassicaceae, family, which encompasses vegetables as diverse as broccoli and watercress. Radish is a cool-season, fast-maturing, easy-to-grow vegetable. Radishes can be grown even on the smallest city lot. Radishes are easy and quick to grow. Cool weather is essential for best radish quality because they become "hot" and woody in hot weather. October is a good time to plant winter radishes, and they are easy to grow. Don’t look for radish transplants at your local nursery. Radishes, like all root crops, are best grown from seeds planted directly into the garden where they will grow. Sow seed 1/4 inch deep in rows 12 inches or more apart. Radishes should be thinned to allow 2 to 3 inches between plants. Make several small plantings at 7-10-day intervals because radishes are in prime condition for only a few days. Harvest radishes when roots are 1/2 to 1 inch in diameter. Radishes remain in edible condition for only a short time. Wash roots, trim both taproot and tops, and store in plastic bags in the refrigerator. They will keep up to a month. Radishes can be classified according to the length of the growing time from sowing to harvest. Short-season cultivars are easy to grow and quick to mature. They are a joy for gardeners anxious to have fresh vegetables for a fall salad, since they are ready to harvest in only 21-30 days from the time seed is sown. These short-season radishes require cool soil to germinate and mild air temperatures to develop well. They can be planted from October through early April (although you might have to protect young plants from freeze damage if temperatures drop into the teens during the winter). Spring radishes should be planted from as early as the soil can be worked until mid-spring. Make successive plantings of short rows every 10 to 14 days. Plant in spaces between slow-maturing vegetables (such as broccoli and brussels sprouts) or in areas that will be used later for warm-season crops (peppers, tomatoes and squash). Spring radishes also can be planted in late winter in a protected cold frame, window box or container in the house or on the patio. Long-season radishes are much larger and slower to mature (50 to 70 days) than short-season varieties. These later-maturing varieties of radishes (Icicle or French Breakfast) usually withstand heat better than the early maturing varieties and are recommended for late-spring planting for summer harvest. Winter radishes require a much longer time to mature than spring radishes and are planted at the same time as late turnips (usually midsummer to late summer). To enrich the soil, add well-rotted compost or manure and work a general-purpose fertilizer into the soil before planting the seeds. 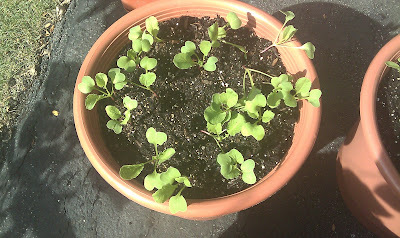 Radishes sprout in a matter of days, but they need a constant supply of water to do so. A steady supply of water – at least an inch a week – will ensure rapid, steady growth. Radishes grow well in almost any soil that is fertilized before planting and has adequate moisture maintained. Radishes mature rapidly under favorable conditions and should be checked often for approaching maturity. Harvest should begin as soon as roots reach edible size and should be completed quickly. Pull radishes when they are of usable size (usually staring when roots are less than 1 inch in diameter) and relatively young. Proper thinning focuses the harvest and avoids disappointing stragglers that have taken too long to develop. Winter varieties mature more slowly and should be harvested at considerably larger size. Once they reach maturity, they maintain high quality for a fairly long time in the garden, especially in cool fall weather. Plan on sowing small amounts of seed every week or 10 days rather that raising one large crop. Potential problems: Why do my radishes grow all tops with no root development? There may be several reasons: seed planted too thickly and plants not thinned (extreme crowding), weather too hot for the spring varieties that do best in cool temperatures (planted too late or unseasonable weather). Radishes may seem like a "fool-proof" vegetable to grow but as usual the reality is a little more nuanced than the theory. On several occasions, the radishes I planted in raised garden beds became "leggy", weak and never formed a bulb. There were several reasons: not enough soon, dry and compacted soil.